please read my eBook Investing With Nothing. Investing is the act of buying something of value that will hopefully increase in value, generate an income, or both. Investing is usually a necessity for people who want to become wealthy. Sure, it is possible to inherit a fortune or to save up enough money to make yourself wealthy; but for most of us, investing will be a necessary tool to building wealth. The trick is to know how, when and why we should invest. 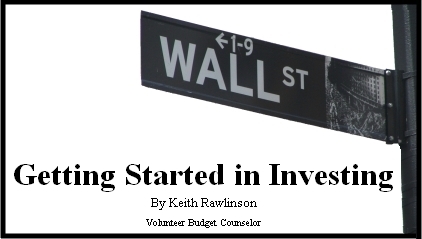 Probably the biggest mistake people make when it comes to investing, is getting started before they're really ready. There are some very important steps that must be taken before one is truly ready to invest. If these steps are not taken, then there is a very strong possibility that the results of the investment will be mediocre, or the investment may fail completely. The preliminary steps are no fun and not very exciting. Most people want the fun, excitement and prestige of being an investor and are not willing to put off investing in order to take care of all of the preliminary steps first. But remember, most people are broke, stressed and financially struggling. The investments that most people make will not accomplish in the future what they had hoped for when they got started. This is normal. You do not want to be normal--at least not when it comes to investing. Never forget that if you'll do now what most people won't, you'll eventually be able to do what most people can't--especially when it comes to finances. So, if you want to give your investments the best chance of making you wealthy, it is very important that you do all of the steps and in the right order. First and foremost, before you start investing, you must have emergency savings. Any money you have set aside for emergencies must be in a regular, old, boring bank account. DO NOT use emergency savings for investing. Investments can do one of four things: go up, go down, stay the same, or become worthless. If you invest money that was set aside for emergencies, and your investment goes up or stays the same, then you would be okay if an emergency came along and you had to pull some money out of investments to deal with it. If, however, your investment goes down, or becomes worthless, then you are in serious trouble very quickly. You may have to pull money out of an investment while it's down in order to take care of emergencies. If that happens, you are pulling money out at a loss which is not a smart investment strategy. Worse yet, your investment may have failed completely (it does happen) and now your emergency money is gone completely. You would probably end up borrowing to handle the emergency which means going into more debt and going backwards financially. Emergency money and investments must be separate. Keep your emergency money in a nice, safe, easy-to-get-at bank account and never, ever use it for investing. To find out how to handle emergency savings and how much you need to have, be sure to read the article You Need Savings. Next, before you start investing, you should be completely debt free except for your mortgage if you have one. Follow the steps in the article Eliminating Debt Completely and get all of your debt paid off. Yes, becoming debt free will take a while, sometimes a few years, but it is a really important step to take before starting to seriously invest. The only exception I have to this rule is if you are having money taken out of your paycheck for a retirement account at work. In that case, try to get out of debt while still allowing your employer to put a contribution from your paycheck into your retirement account. The reason that getting out of debt before investing is so important is that you are generally paying interest on all of those debt balances. That's why, in my counseling sessions, I teach people to invest in their debt. If you invest in your debt, it's like having a guaranteed return on your investment equal to the interest rate you were paying on the debt. In other words, if you pay off a debt that was charging 12% interest, it's like getting a 12% return on your money with zero risk. Investing while carrying a debt load can be like taking two steps forward and one step back. You may be making headway, but it is very, very slow. If, for instance, you have a debt charging you 12% and an investment that's paying you 14%, you are taking all of that investment risk for a 2% return. And if your debt interest is more than your investment return, which is the norm, then you are actually going backwards financially. Yes, getting out of debt first does require you to put off investing for a while--sometimes quite a while--but once the debt is taken care of, you can quickly catch up and then go much farther ahead than you would have been able to with the debt load. Think about it this way: If you paid off all of your debt, you would have extra money available in the amount of whatever you were making in debt payments. Just for the fun of it, quickly add up all of the monthly debt payments you currently make. Now, imagine having that amount to invest each and every month! Investing that much money each and every month adds up very, very quickly. So yes, getting out of debt first causes you to delay your investing, but once the debt is eliminated, you catch up very fast and then continue to build investment wealth at a rate that will amaze you. Getting out of debt before investing is the most difficult preliminary step, and it's the one most people won't bother to do. If you try to do things the way most people do, then you will end up where most people are. How many people do you know who have truly invested their way into wealth? Yes, I'm sure you know people who have investments, but how fast are those investments really growing and are those investments making these people wealthy? If you first eliminate debt before starting to invest, you will put yourself way ahead of the average person. Trust me, most people's investments aren't doing as well as they try to make you believe. And even if someone's investments are doing well, if they are carrying a debt load, then in the future it will probably all even out anyway. They will likely, eventually have to use their investment earnings to pay off debt and won't really be getting ahead by much. If, on the other hand, your investments grow and you don't have any debt to pay off, all of that money is yours. For more information about the steps needed to become wealthy, be sure to read the numbered articles, especially the checklist. Before we get into exactly where to invest your money, we need to go over a few, basic rules. These rules will go a long way toward keeping you out of trouble, and will significantly increase the chances of your investments being successful. First, and foremost, NEVER invest money that you cannot afford to lose. I have seen too many cases where people decided to invest emergency money, college funds, next month's rent, their mortgage payment, money belonging to their children, etc. Most of the people I have counseled who have done this, thought that they were going to multiply the money, then replace it from the returns on their investments. Most of the time, it didn't work out that way and they ended up losing much, if not all, of the original money. Money that you invest should be money set aside for that purpose. Do not invest money that is really intended for other things. Do not invest money that is needed to meet day-to-day expenses of living. Losing money in an investment may mean you can't retire as you had wished, or might mean that you can't buy luxury items you wanted, but it should never cost you your house, car, emergency savings or your future. If you intend to invest some money, and losing that money would mean significantly lowering your current standard of living, then you should not invest that money. When you invest, don't think about all that you're going to do when the investment grows; think about what you will do if the investment is lost. If the thought of losing that investment money terrifies you, then don't invest it. Personally, when I invest in anything, I consider that the money will be lost and gone forever. If I still feel comfortable making the investment, then I go ahead and do it. If I couldn't bear to lose that money, then I don't invest it. Never invest money that you cannot afford to lose. With the possible exception of real estate investing, never borrow money to invest. And in the case of real estate, borrow as little as possible and only if you could still make all of the payments even if the investment generated no income or went bust. Depending upon the investment, it is very, very common for investment ideas to under-perform or to fail completely. If you borrow money to invest, you could end up paying back the borrowed money for years after the investment went under. If you are struggling to make the payments on a lost investment, then you likely won't be able to start investing again until it is paid off. That can set you back for years, decades or even for the rest of your life. Don't be in a hurry. I have a saying I use in counseling: "Good investing should be boring." If you are investing in fun, exciting, adrenaline-producing investments, then you are likely taking far too much risk. Understand that most people who become rich, and manage to stay that way, build their wealth little-by-little over time. A good investment often takes five years or more to really start to do much. If you can't leave the money alone for at least five years, and preferably ten years, then don't invest it. A get-rich-quick mentality will usually destroy an investor. Don't fall for all of the latest and greatest schemes that claim to be able to make you wealthy with very little time or effort. There is a big difference between investing and speculating. Investing is buying something of value which will hopefully generate income or appreciate in value over time. Speculating is putting money into something with little or no immediate value which could have high returns, but is just about as likely to fail as to succeed within a short period of time. Speculating has its place, but only if you are investing no more than 5% of your total investment money in speculative investments, and you understand that the money is about as likely to be gone as it is to grow. Get-rich-quick ideas are, by definition, speculation--not investing. Never be in a hurry. Always invest little-by-little over time. If anyone tries to pressure you into making a quick decision about an investment, then say 'no.' It is better to miss a few legitimate investment opportunities, than to get stuck in even one bad deal. Beware if anyone tries to tell you that you can make a whole lot of money in very little time and with little effort. Any investment that appeals to laziness is very likely a bad investment. Understand the relationship between risk and reward. The higher the potential reward, the higher the risk. This is ALWAYS the case. In fact, knowing this relationship between risk and reward is a great way to evaluate potential investments. If someone tries to talk you into an investment by telling you that the return will be very high with little or no risk, then you know that something is wrong. Further, if you are presented with an investment that has a slow, steady return but the risk is high, then again you know that something is wrong. Speculative investments offer a high potential return, but with a very high risk. Slow, steady investments offer a lower return than speculative ones, but also have a fairly low risk. No matter what ANYONE tries to tell you, always remember that the higher the potential return, the higher the risk--ALWAYS. If an investment sounds too good to be true, then it probably is. Before investing in anything, make sure you completely understand how it works. If you couldn't explain the investment to someone else in two or three sentences, then watch out! It may not be legitimate, or it may be too far beyond your level. Never allow yourself to say something like "I don't totally understand how it works, but the guy that sold it to me explained it very well and it sounded good to me." If you buy an investment that you don't completely understand, then you are putting that money totally into someone else's hands. How can you determine if it's a good investment, or evaluate the risk, if you don't even understand how it works? You can't! So don't try. Always do your homework: Read up on the subject, research it on the Internet and make sure you are getting both sides of the story. Be certain you totally understand an investment before putting money into it. Always be diversified. Being diversified means having your investment money spread out over several, different investment. In other words, never have all your eggs in one basket. If you are diversified, and one of your investments goes bad, you only lose a small portion of your investment money, and the other investments can help make up for it. If you have all of your investment money in too few investments and something goes wrong, you can lose a big chunk of your investment money and possibly lose all of it. Being diversified does often slow down your investment returns a bit, but it also significantly reduces your risk. To be perfectly honest, most truly wealthy people accomplished their financial goals with very simple, basic investments. On television and in the movies, the rich are often portrayed as investing in all kinds of complicated, sophisticated, and fast-paced investments. This is generally not the case. Most rich people built their wealth with slow, basic, fairly simple investment strategies. You need to do the same. If you want to be rich, then it makes sense to do what the rich do--and the rich generally keep their investing simple. Let's first talk about common things NOT to invest in. Never invest in any get-rich-quick idea. Never invest in anything that seems to violate the risk-reward principle I've already discussed. Understand that some investments are riskier that others. Investing in starting your own business. Most new businesses fail within the first five years. Not some--but MOST. Starting your own business is not a bad idea, as long as you have other investments going, you can afford the risk, and you're sure that you are ready to start your own business. Too many people think that they have the next great restaurant idea. The truth is that new restaurants fail at an even higher rate than other businesses. Buying stock in only a few companies. This is simply just a matter of poor diversification--all your eggs in too few baskets. If you can't afford to buy stock in at least 100 different companies, then the risk is just too high. However, there ARE some fairly safe investments you can make in the stock market. You can find out a lot more about that in my book. Real estate can be a good investment, but ONLY if you really know what you are doing. A bad real estate investment can destroy you financially. I DO NOT recommend real estate for someone just starting out in investing. The risk can be very high, there are too many unknowns in any real estate deal, and things can go bad very quickly compared to other investments. Real estate can be a very good investment opportunity if you have other investments going, you can afford to take the risk, and you take the time to really learn about it. Avoid those little weekend seminars that teach you 'how to get rich in real estate.' Most of these seminars will teach you just enough to get you into serious, financial trouble. As I said before, start by investing in your own debt. Eliminating debt is a guaranteed, positive return on your investment and frees up even more money to invest. Until you can get out of debt, and stay that way, paying off your debt should be your only investment. You'll want to buy your funds through a well-known, trusted broker. I personally like Vanguard and TD Ameritrade, but I am not recommending them specifically and cannot recommend any one broker. There are just too many brokers with too many different philosophies for me to recommend any in particular. Do your own research. With the exception of the Money Market Fund, try to choose funds that have been around at least ten years and have a good track record of returns. I do strongly recommend that you go to Dave Ramsey's website and click on ELP for investing. An ELP is an Endorsed Local Provider who is pre-screened, trusted and can help you get your investments going in a way that is safe and tested. Finally, if you are determined to invest in the stock market yourself, without going through a Mutual Fund, then please don't buy stock in individual companies. Invest in the stock market by buying ETFs. An ETF is an Exchange Traded Fund. An ETF is like a mutual fund that trades like a stock. You can buy shares, sell shares, and even do derivative trading with them. Don't worry if you don't know what derivative trading is--you're probably better off without it. ETFs come in many varieties. They buy stocks in certain types of businesses, industries, sectors or indexes. My personal favorites is the index ETFs. An index ETF holds shares of every stock included in the index upon which it is based. In other words, a DOW ETF would hold shares in every stock in the DOW Industrial Average. An S&P 500 index ETF would hold shares of every company in the Standard and Poor's 500. The potential returns are a bit lower than with individual stocks, but the risk is fairly low and the diversification is fantastic! For a lot more information, please read my book about getting started in the stock markett, even if you have little or no money to invest. Honestly, investing in your debt, Mutual Funds and ETFs are about all that most people would ever need. In fact, as far as I know, these are the most common investments used by the rich. Remember, I said that if you want to be rich, then do what rich people do--especially when it comes to their investments. If you are just getting started in stock market investing, or hope to, especially if you have little or no money to invest, I highly encourage you to get started right by reading my book Investing With Nothing: How to get started in stock market investing with no money to invest. There is much more information in the book than I could possibly cover in this article, and the book teaches you everything you need to know to get started investing in the stock market. This article copyright © 2009, 2017 by Keith C. Rawlinson (Eclecticsite.com). All rights reserved.